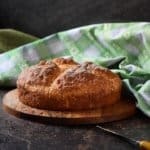 Home » Breads » Irish Soda Bread: Only 3 Easy Steps! 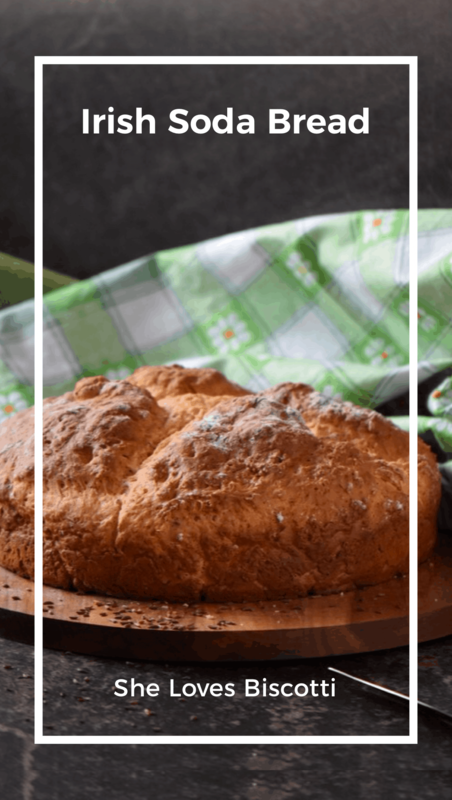 Irish Soda Bread: Only 3 Easy Steps! 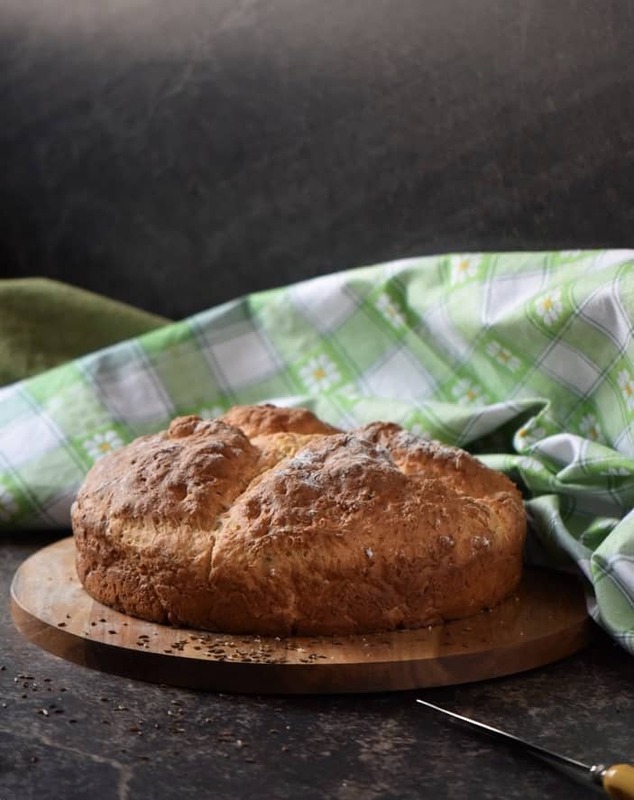 This non-traditional Irish Soda Bread recipe comes together in the time it takes for your oven to preheat. You will fall in love with this thick crusted yeast free bread. This post was originally published on March 6, 2015 and republished on February 25, 2019 with updated content, pictures and a video (located in the recipe card). Thanks for watching and sharing. The main reason I love to make this bread is that it is quick to make. It is so quick that by the time your oven is preheated, you are done combining the ingredients and placing the pan in the oven. This Irish soda bread with caraway seeds is a great compliment to any thick soups like this White Bean Soup. This Irish bread is also great with Veal Stew. …hence the name Irish soda bread. Apparently, that’s the way the Irish made it back in the 1800’s (in Ireland). Over the years, this soda bread became a base for all sorts of add-ins like raisins, cranberries, herbs, and so on. In its transition, it became a sweet quick bread as sugar and eggs were also added-hence the reference to a Non Traditional Irish Soda Bread. Just like this recipe for Honey Wheat Bread, the ingredients come together very easily. There is no yeast, no kneading – heck there isn’t even a mixer required to make this bread. Sugar. Just a touch to create a slightly sweet Irish soda bread. Baking soda. This will allow encourage the bread to rise. Baking powder. Always check to make sure the dates are still good. Caraway seeds. These contribute an earthy flavor. Sour cream. Preferably a low fat version. Buttermilk. Yes, this is an Irish soda bread with buttermilk! As far as accessories are concerned, all you need is two bowls, a whisk, a wooden spoon and a knife to ward off the evil spirits-more on this old Irish superstition a little later. You also need a 9 inch spring form pan. In a large mixing bowl, sift or whisk together all of the dry ingredients. These include flour, sugar, baking soda/powder, salt and caraway seeds. Set it aside for a minute, while we whisk the wet ingredients together. In another bowl we are going to whisk a couple of eggs with sour cream and buttermilk. Add the wet ingredients to the dry ingredients and combine with a wooden spoon. You will quickly notice that this is a very sticky and thick dough. Do not be tempted to over mix this batter. 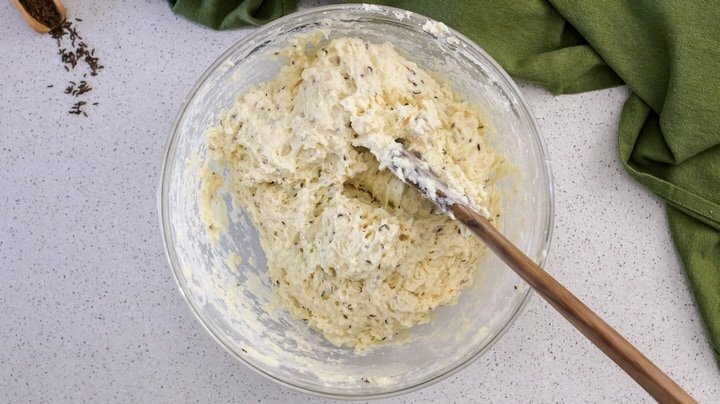 Just like making muffins, over mixing will toughen the texture of this Irish bread. Transfer to a 9-inch spring form pan which has been coated with a non-stick spray. With lightly floured fingertips, or a spatula, gently spread out the batter to the edges of the pan. Whether you are making the traditional or non-traditional version, you should always score a deep “X” on the top of your bread before baking it. Not only does it help the baking process (allowing better heat distribution) but it protects your household by warding off the evil spirits. 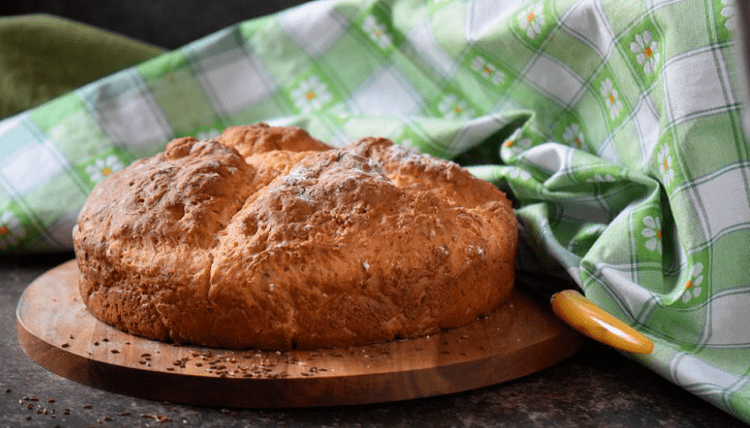 The only thing left to do is to bake your Irish soda bread! Preheat your oven to the right temperature, this is crucial to obtain a good rise. 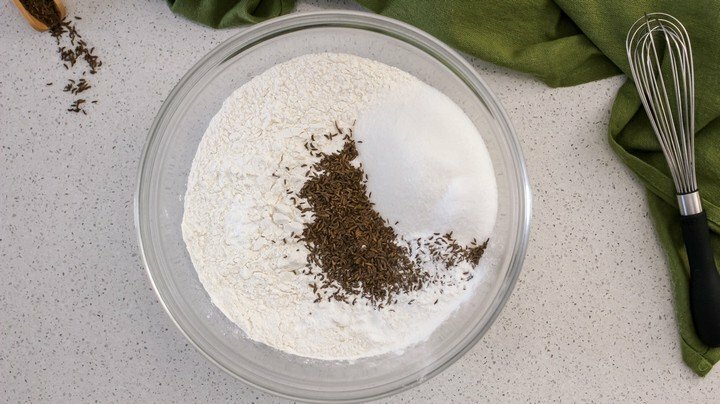 Properly whisking the dry ingredients ensures even distribution of the baking soda and baking powder, which in turn ensures a uniform rise in your caraway bread. Do not over stir; simply combine the wet with the dry ingredients and bake. Score the top of the bread before baking to improve heat distribution throughout the bread. Can I add raisins to the batter? Yes, simply add ½ cup if you prefer a recipe for Irish soda bread with raisins. I don’t have buttermilk, what do I do? You can easily make buttermilk by adding lemon juice or vinegar to regular milk, stirring and allow to rest for 5 minutes before using. For this recipe, add 1 teaspoon of vinegar or lemon juice to 3/4 cup plus 1 tablespoon of milk. How long does this baking soda bread last? If properly wrapped in plastic film, this bread can be stored at room temperature for 3-4 days. Can also be frozen for up to 3 months. 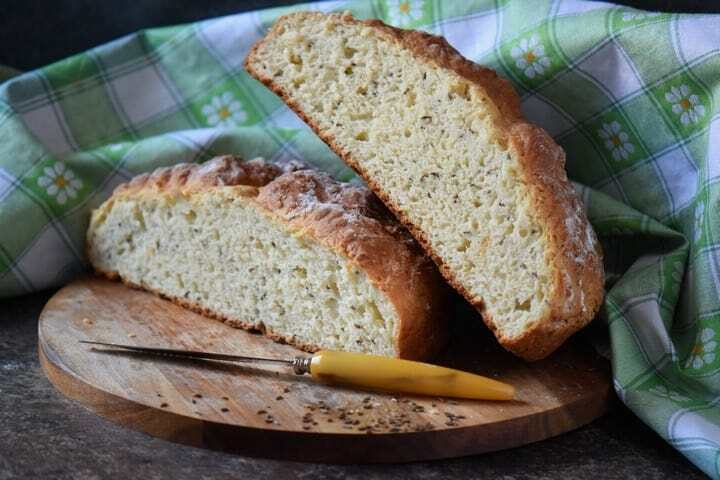 There is no lack of recipes whether you are looking for a traditional or non traditional Irish soda bread. I’ve adapted this easy Irish soda bread from a recipe I found on this site. Over the years, I have made a couple of changes to the recipe. I decreased the amount of sugar and salt found in the original recipe; I replaced 1 cup of sour cream with ¾ cup + 1 tablespoon of buttermilk. Also, I excluded the raisins which are not very popular in my household. Feel free to throw in a handful if you like them in your bread. ★★★★★ If you have made this recipe for Irish Soda Bread , I would love to hear about it in the comments below and be sure to rate the recipe! This Irish Soda Bread comes together in the time it takes for your oven to preheat. You will fall in love with this thick crusted yeast free bread. Preheat oven to 350℉ (175°C). Spray 9-inch spring-form pan with non-stick spray and set aside. In a very large mixing bowl, sift or whisk together the dry ingredients. Add in caraway seeds and set aside. 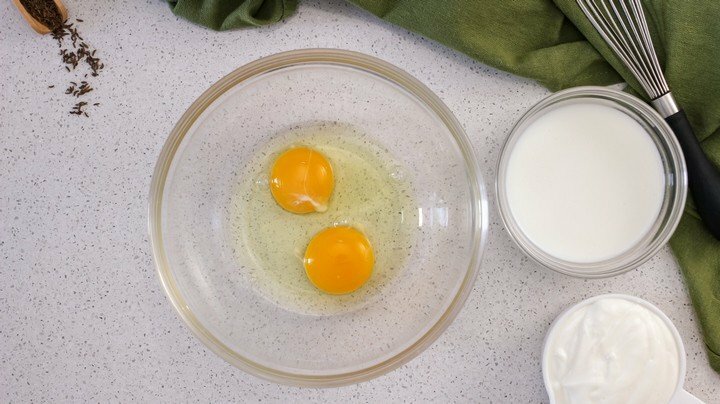 In another medium bowl, whisk eggs. Whisk in sour cream and buttermilk. Add the liquid mixture to the dry ingredients and mix only until combined with wooden spoon. Place batter in a pan. 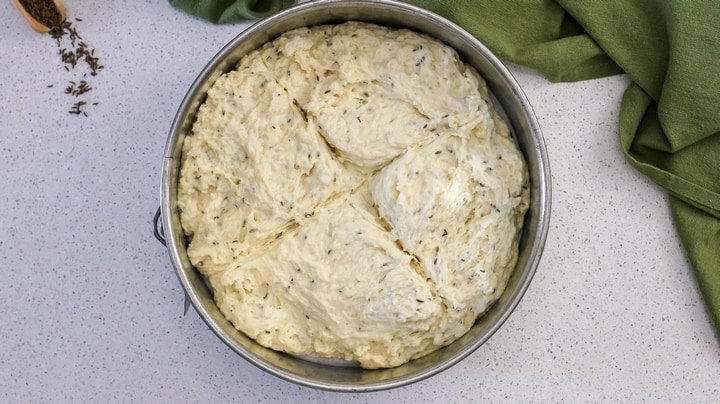 With floured fingertips, or the back of a spatula, press gently to extend the dough to the edges. Score an "X" with knife. Bake for approximately 50 -60 minutes. Allow the bread to cool down for about 15 minutes before slicing. Can I add raisins to the batter? Yes, simply add 1/2 cup if you prefer a recipe for Irish soda bread with raisins. I don't have buttermilk, what do I do? You can easily make buttermilk by adding lemon juice or vinegar to regular milk, stirring and allow to rest for 5 minutes before using. For this recipe, add 1 teaspoon of vinegar or lemon juice to 3/4 cup plus 1 tablespoon of milk. I just made this. Used fennel seeds and it smelled so wonderful. Such an easy recipe and so delicious. This looks great! Thanks for submitting to YG – I added it to the “Green Drinks and Recipes” category so it will be highlighted for St. Patrick’s Day! Thanks for the feature! Happy St.Patrick’s Day!